spider kong and cody’s skirt. This is the back of my house. Behind my house is a forest of sorts with a stream running through it. We’ve heard raccoons getting it on, owls hooting it up and lots of frogs. We’ve seen fireflies, blue herons, hawks, possums and so many bunnies we started telling Addie they were her pets. Tthe other night I heard desperate squeals from the dark in the back so I looked out to see what the problem was. The problem was my husband. 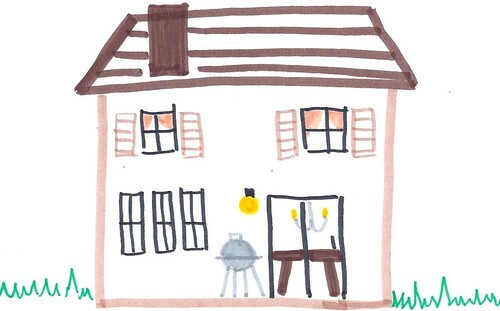 He was rendered helpless because (in his mind) the back of our house looked like this. I kill the spiders in our relationship. However, as much as I hate to admit this, spider kong did kind of shock me. That kind of crap should be reserved for nightmares. In total I nailed about seven spider kongs with a rolled up issue of Golf Digest while Cody hid safely inside with his skirt. My sister catches and releases spiders. If we played that game out here? The spiders would win. I’m bigger for a reason. Spider kong is creepy!! I tend to kill the spiders in our relationship – although the only time my husband screams like a girl is if there is a snake (again, a matter I tend to). Sometimes role reversals are so not fun. I can’t believe how huge that thing is. I mean…. I’d kill it if I had to but if you volunteered I would definitely run scared. They make their webby things in between the glass and screens. I have about 4 of them right now, I’m about to start charging rent….they are huge! Your drawing with the spiders freaks me the eff out. I hate them. HATE. THEM. Your drawing gave me chills. Seriously. Can you never do that again? The drawing was worse than the actual spider. Although knowing there were like 8 of them. I suddenly feel stuff crawling all OVER me. Holy mother, the clipart alone freaked me out. The actual PICTURE makes me want to run. I’ll take snakes over eight-legged, multiple-eyed spawns of hell anyday. Um, I think I would have to move if they kept making appearances like that! Yikes. spiders the size of large coins? Um…no. I would need you to kill them for me too. I also live in Indiana. I found a Spider Kong last night also. I found spider kong’s cousin in my basement! ICK…I hate spiders! One of the hardest things I had to swallow when I moved out of my parents house so many years ago was realizing that I would be responsible for all future bug killing. Le sigh. Yeek! We have wolf spiders here that are about that size. They have hair and huge pincher thingies. I am the spider killer in my house. My oldest daughter would keep them for pets (kinda) and my youngest is terrified. I usually keep a can of hairspray around to spray at all kinds of bugs, it dries on their legs/wings and slows them down so I have a fighting chance. We have that same sort of setup in our back yard (just add coyotes) and GREATGOOGLYMOOGLY were the spiders awful for a while. Then one bit me on the leg and left a bruise the size of China. I limped my way to the store and grabbed a Really Big Bag of pesticide. I have funnel spiders in my ivy outside. They are huge, and creepy, and just awful. @Brittany, Oh why did I have to google funnel spiders! WHY!!!!!!!! Wait, what does a skirt have to do with anything? Does Cody actually wear skirts? Who knows … maybe he’s Scottish? OK, that spider was HUGE, but still, no matter how big the spider, a man has to be a man. I can handle the spiders. It’s the frogs that freak me out. 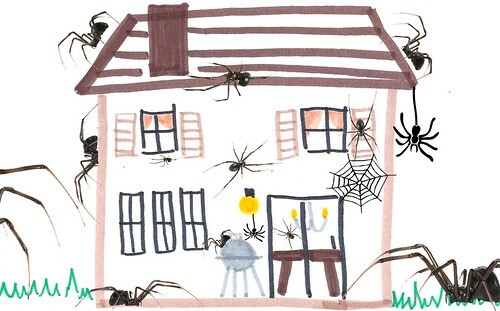 Um… that drawing of your house covered in spiders has totally given me the willies. In Florida, they’re the size of your hand sometimes. AHHHHHHH!!!!!! I hear you have huge roaches there too! @Tiffany, We do but people call them palmetto bugs. Whatever! They are GIANT ****roaches. Ewwwww! Thanks to being in the great white north our spiders try to move in with us in the winter – um, no thank you! Glad to hear you got them all taken care of with minimal damage. Holy Shnikies Batman!!! That is a killer spider. So glad I am not you. I was thinking as I read the beginning of your post of how lovely it would be to go visit you and see your new house until I got to the picture of Spider Kong. OMG, did you draw those things, they are nasty! Now my skin is crawling! That picture gave me body chills. I say no clemency for spiders that big and scary! Yeah, I name the spiders out here. I actually don’t even catch and release anymore. Did you know (God’s creation amazes me) that animals like spiders, crabs, ants, etc. don’t have muscles? They have an open circulatory system and their limbs move from hydraulics as they pump their blood into and out of their appendages. OMG, you are a woman with a capital W! I can’t believe you could kill spiders that big. Although now that I think about it, my mom does that before I come to visit my parents because they have those big brown spiders that live in the overhang on the back porch. And it only took me threatening to stay at their house until morning – when they’re hiding (I don’t think about that part)- for her to kill them before I come over. Nothing like the threat of your adult child back at home to motivate you! We have those exact same spiders inhabiting the corners of our front porch. I HATE them! They make me want to go back to Michigan where spiders know better than to get that big – or glow. 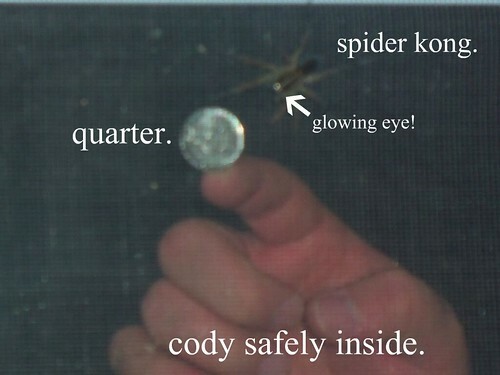 I have to say, I agree with Cody, spiders are icky. Well, bugs in general are icky. I’ve been battling those drain flies this year. I hate them. “with his skirt” HA! Poor Cody. Dude. You can draw a wicked spider. I’m with you, if they invade my space, suckers gotta die. I think it is hilarious that you deal with the spiders. You’re superwoman! On my end of things, I have to deal with the bees.